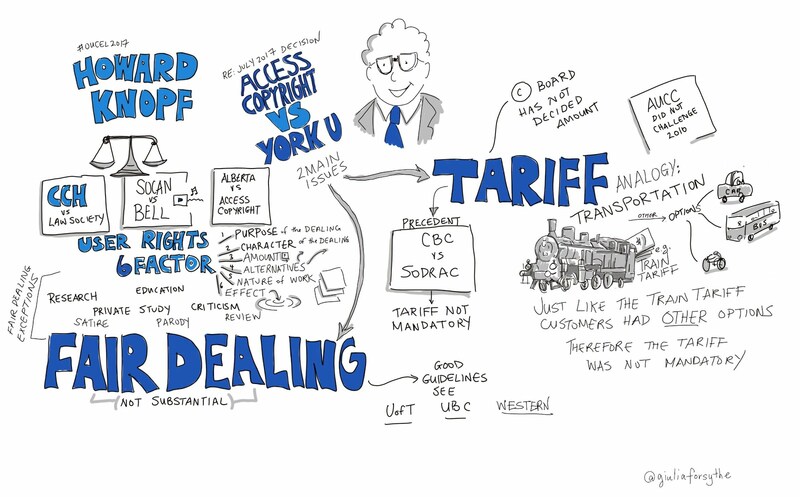 The Canadian educational community awaits York University’s Notice of Appeal from the July 12, 2017 decision of the Federal Court in Access Copyright v. York University. Regrettably, in the meantime, two major universities – namely Western and York itself – have recently issued copyright statements that appear to be premature, ill-considered and even incorrect reactions to the York decision. Western appears to have taken upon itself an automated total “book burning” approach to pre-existing online course material. Apparently, instead of relying on the general users’ right fair dealing provision in s. 29 of the Copyright Act, it has slavishly followed the destruction provision of the limited and arguably ill-conceived, poorly drafted and unnecessary “lesson” exception in s. 30.01. Such a seemingly misplaced reliance is directly contrary to the unanimous ruling of the Supreme Court of Canada at para. 84 of the CCH decision, where the Court held that it is unnecessary to rely on a specific exemption when the general fair dealing provision is available. Obviously, any archived course material that has been legally posted with permission, by way of fair dealing, or otherwise does not need to be deleted. Western’s denial that this has anything to do with the York decision is unconvincing in light of an earlier announcement and, frankly, rings hollow in terms of the newly stated rationale of “system maintenance”. Perhaps even more astonishingly, York issued the following overreaching and incorrect prohibition just 8 days after the decision was released: “Copyright law does not permit downloaded files (PDFs, etc.) to be loaded directly into Moodle or other course web sites.” Since when does copyright law categorically prohibit the uploading of “downloaded files” to a course website? Such uploading and sharing may very well be done legally, for example on the basis of permission, an implied right, pursuant to users’ fair dealing rights, or because the work may be in the public domain. Both of these announcements are bound to cause considerable consternation and confusion just as classes are about to begin. The source for these highly problematic pronouncements is unclear in both instances. If two such high-powered institutions with access to so much copyright expertise (which, in the case of law faculty, was probably not called upon) can overreact in this manner, one shudders to think what institutions with less available expertise will be doing. It may be noted that Access Copyright has so far refrained from availing itself of Justice Phelan’s unusual invitation to “apply for an injunction prohibiting the Defendant from reproducing or authorizing reproduction of all copyright protected works falling within the Approved Tariff and offering such reproduction for sale, rent or distribution until all amounts of royalties plus interest are paid.” Instead, York seems only too eager to effectively enjoin itself from what appears to be perfectly normal and indeed essential pedagogical practice. York University has publicly committed to appeal the July 12, 2017 judgment of the Federal Court. Although it has until October 2, 2017 to file such a document (because July and August do not count for this time calculation), the normal deadline is 30 days after the decision. It is to be hoped that York does not delay much longer as the fall term begins. Such a document would, at least, provide the academic community with a “complete and concise statement of the grounds intended to be argued”, as required by the Federal Courts Rules. This may provide some further insight into how York is reacting to the ruling and what York believes it can overturn in this decision and generally on what basis. It would also, crucially, enable potential interveners to further assess whether and how they may wish to apply for leave to intervene in order to assist the Court with respect to arguments that could potentially be instrumental in determining the outcome (for example, see Prof. Katz’ blog here). Many of York University's licences do not permit copyright-protected content to be uploaded directly to Moodle or other Learning Management Systems. That statement is somewhat ambiguous and hopefully does not suggest that a licensor can impose any conditions on works not covered by the particular licence. Moreover, the issue of whether a licensor can impose enforceable restrictions on users' fair dealing rights as provided by statute is an open question, particularly in light of two Supreme Court of Canada decisions. More about that another day. 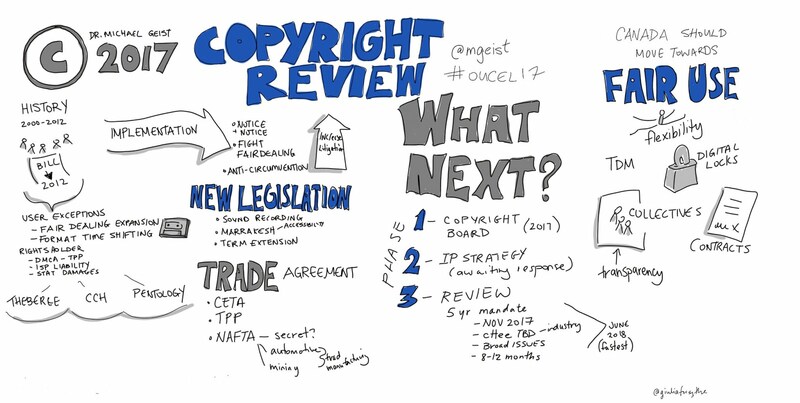 Giulia Forsythe, Canada's Diva of Doodlers, has Definitively Distilled in this Divine Depiction of the Diverging Directions of Debate on the Canadian copyright front in these two Distinctive Doodles from last weeks October 17, 2017 #OUCEL17 Copyright event that she organized for university copyright professionals at the University of Ottawa. Here are the slides for my talk. My talk is depicted above. Michael Geist's is depicted below. Thanks, Giulia, for the invite and distinguished doodles. Rogers is seeking leave to appeal the recent Federal Court of Appeal ruling that denied it cost recovery for compliance with the Voltage court order in the reverse class action litigation. Some background from my blog is here. A news report is here. Rogers’ Leave to Appeal material is here. 1. What are the obligations imposed on Canadian ISPs by the Notice and Notice Provisions? 2. Do those obligations supplant ordinary principles related to third-party discovery orders, and in particular, the principle that a third party should be reimbursed for the costs it incurs? It will be interesting to see if Rogers gets leave, and if so who may wish to intervene. York University will have a chance to file written submissions in response. It may be noted that cost recovery in the Federal Court is normally only a portion of the party’s actual costs. It also may be noted that cost recovery normally proceeds even while an appeal is pending, unless there is a stay order in place and this is rare. Apparently, York has made no attempt to stay the costs order process or any other aspect of Justice Phelan’s judgment. York’s costs will not become public unless and until it succeeds on appeal and gets an order for costs below and files material in support of its costs claim. What we do know so far is that in December 2015, it was estimated that this litigation would cost York and contributing institutions “hundreds of thousands of dollars, if not a million”, according to York GC Maureen Armstrong in an interview reported on December 29, 2015. I have no information as to whether that estimate is still valid. Access Copyright is seeking a lump-sum award approximating 50% of the expenses incurred by it to employ its salaried litigation counsel in this litigation and 100% of its out-of-pocket disbursements. The judgment lists three counsel for Access Copyright. By comparison, York University has five counsel listed in the judgment from a large outside law firm. For those interested in how this case unfolded, there are some interesting details in Roanie Levy’s affidavit. I will likely have more to say about this in due course. But, for the moment, suffice it to say that this sought-after figure of ~$550,000 is only for Phase I and, of course, does not include any potential damages. This is my CIGIOnline op-ed published August 9, 2017 concerning copyright entitled “Canada Can Stand Its Ground on Copyright in NAFTA Renegotiations: It’s all about knowing when to say no”. This was based on the first part of my aforementioned July 18, 2017 submission to Global Affairs.